Marketing KPIs (Key Performance Indicators) are specific, numerical marketing metrics that organizations track in order to measure their progress towards a defined goal within your marketing channels. When it comes to setting and tracking your marketing KPIs, many marketers and business owners are fully aware of the usual suspects. Sales revenue. Leads. Cost per acquisition. But there are a number of other KPIs that you should be tracking in order to execute a more successful marketing campaign. No one wants to support a marketing activity that's losing their company money. By tracking the right marketing KPIs, your company will be able to make adjustments to various strategies and budgets. Without the right ones, however, your company might be reporting and making decisions based on misleading information. Free Guide: Find out how to fix the 6 critical marketing KPIs your boss actually cares about. 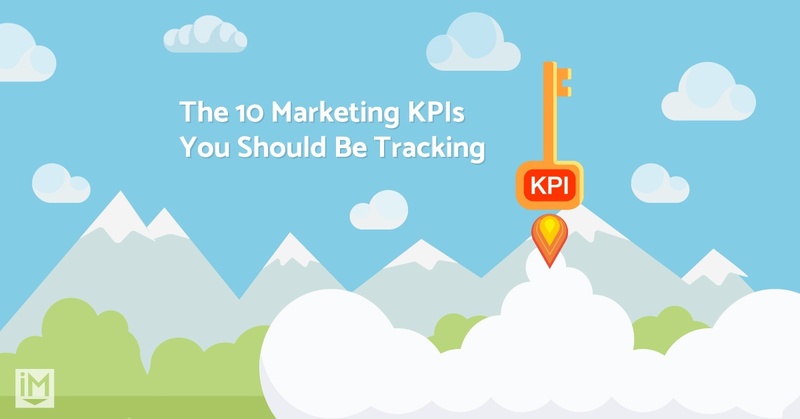 Which marketing KPI's should you be tracking? Here are the 10 most important ones that, in our experience, matter most to marketers. How much revenue has your inbound marketing campaign brought your company? Understanding your sales revenue is important to knowing how effective your inbound marketing campaign is. No company wants to spend money on something that isn't generating money. Most likely you would move that money to other marketing activities. To determine your sales revenue from inbound marketing you must first have a thorough understand of what you mean by inbound and outbound marketing. You can calculate your sales revenue from inbound marketing by utilizing the following calculation. Note: At IMPACT, we track this metric and a host of others for clients in a custom Databox template. You can get the template for yourself here! Not only do you want to calculate your customer acquisition costs for inbound marketing, but outbound marketing as well. How much is it costing you to acquire a customer through inbound marketing versus outbound marketing? Calculating your customer acquisition costs requires the integration of your marketing automation and CRM platforms as well as accounting for all relevant costs associated with ERP integration. Once calculating the costs associated with your inbound and outbound marketing campaigns, you can directly account for new sales, as well as allocate particular budgets for each campaign. If your company is utilizing mostly inbound marketing, you can break down that component further by campaign types then assess how successful and profitable each activity is. When you know that, you can start implementing activities to improve over time. With inbound marketing, there is no better way to measure customer value than reach out to your current customers. Not only can doing this help you keep in contact with leads, but it can also help reduce churn, keep your customers happy, and expand your customers lifetime value. A great way to increase the lifetime value of your customers is by developing lead nurturing campaigns that reach out to existing customers. Providing you and your sales team the opportunity to inform existing customers about new services, products, and resources. Every company wants to see their return on investment! Calculating your inbound marketing return on investment is huge to help assess your monthly and annual performance. Equally important is the ability to start planning strategies and budgets for the following year or even months. You don't want to continue adding money or increasing your budget for a marketing activity that is costing your company money. So, no matter what marketing activity your company is using, your return on investment will determine the future with that activity. Understanding your website traffic, especially knowing where your it is coming from, whether it's organic, direct, social media or referrals is extremely important. If your traffic is steady or increasing, but your traffic-to-lead ratio is low or decreasing, that's a surefire sign that something is missing on-page. In the spirit of conversion rate optimization, track this number to help you determine if and when a change in your website's text, design, form, etc. may be needed. After all of your marketing efforts, it's important to know how many leads your sales team is able to close. You will want to calculate both your sales qualified lead conversion rate and sales accepted lead conversion rate. Sales Qualified Leads are leads considered to be sales ready based on their lead score or specific activities/triggers they completed. Most companies would consider a lead who filled out a form, such as "contact a rep" a lead who is ready to buy your service or product. For example, a waste management company with a lead who filled out the form "rent a dumpster," would be considered a sales qualified lead. Sales Accepted Leads are simply leads your sales team considers opportunities, and have either contacted the lead directly or a scheduled call. Is my campaign capturing leads? Is our CRM successfully passing qualified leads to sales at the right time? Do we have high close rate? If the answer to any of these questions is no, meet with your sales team to determine what, if anything, is missing and how you can work together to improve your numbers. Here are a few questions to help encourage sales enablement and move the conversation along. Note: This is another metric we track in Databox. Get our "Ascend" template here. So your landing page is up; it's beautiful, it follows all the best practices, but is it actually converting? A landing page that doesn't generate leads is useless, no matter how much traffic it gets or how beautifully designed it is, so monitor your conversion rate. Find out how to improve your landing page conversion rates here. Like your traffic to lead ratio, if your landing page is getting a lot of traffic, but has a low conversion rate, then it is a red flag that you need to change something on the page. Note: We track this one in our "Convert" template on Databox. The goal of any business using inbound marketing is to have most of their traffic come from organic search. High organic traffic means that people are finding your website on their own, minimizing not only your effort for your cost of attracting them to your site. It should come as no surprise that organic traffic is directly correlated to your SEO strategy, so make sure to monitor this number (along with your keywords) and refine your SEO strategy accordingly. Many clients are often wary about the importance of social media in their inbound marketing, but over the years it has proven invaluable to every campaign's success. With social media sites like Twitter, Facebook, LinkedIn, Google+, Pinterest, and Instagram you might not have all the time in the world to effectively utilize every platform, but breaking them down by the number of leads, customers, and percentage of traffic coming from each will help you determine where to focus your efforts. Is your website effectively optimized for mobile? With so many people browsing the web exclusively from their smartphones and devices and Google showing preference for sites optimized for mobile, you need to know how your visitors are using it. Understanding how and what your visitors are doing on your website on mobile will help you improve the experience, and optimize it to increase mobile conversions. Want to learn more about marketing KPIs? Fill out the form below to get the full report on how to fix 6 more critical marketing kpis that your boss actually cares about! Hubcast 199: Reporting, Reporting Reporting, & a Special Guest!